The sixteen unique Victorian detached gardens at Hill Close overlook Warwick racecourse, and have restored brick summerhouses listed Grade II. 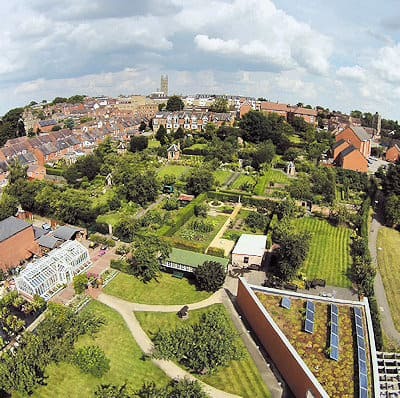 The leisure gardens were created by tradespeople in Warwick in the 1800s in order to enable them and their families to escape from the congestion and pollution of the town. The gardens retain their secret nature with access through wooden doors off lanes with high hedges and each garden has its own individual character. There are herbaceous borders, over 80 heritage pear and apple trees, over 100 varieties of snowdrops, 19thc daffodils, many varieties of asters and chrysanthemums and heritage vegetables. Special features are the croquet lawn, auricula theatres, plant heritage collection, display of antique garden equipment, large glasshouse for tender plants and the contemporary sustainable visitor centre. There is a children’s garden and a garden trail for younger visitors. Horticultural, historic and educational events are listed on the website. Opening times: April 1st – October 31st 11 am – 5pm last entry 4.30pm. Tearoom open weekends & Bank holidays. 11 – 4pm. October 31st –March 31st 11am – 4pm last entry 3.30pm. Tearoom closed at weekends & Bank holidays. Special weekend openings for snowdrops in February. Group Tours: Minimum number 10. Talk, guided tour, tea/coffee and cake £8.40 per head. Facilities: Shop, Plant Sales, light refreshments. Room / Venue Hire. Disabled access: Level access, disabled WC, disabled parking spaces by gates, wheelchair available, recommended wheelchair route. Booking contact: Centre Manager, Hill Close Gardens, Bread & Meat Close, off Friars Street, Warwick CV34 6HF.